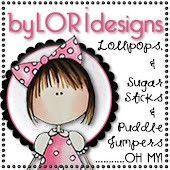 I am sooo happy I am now on The Pink Elephant Design Team. I can hardly believe it, but it is true, my Mom (Lori Boyd) and Ms. Robin said I can be on the team!!! I thought I was going to have to be 18 before my Mom would let me. On December the 5th, I will be 13 years old, so I told my my this could be my birthday present!! Thank you very very much Momma and Ms. Robin!!! This week's challenge is a sketch challenge and my mom made the sketch but Ms. Frances (Mom says she likes Owls...I do too) made it pretty on the computer!! I used some old tissue paper, I found in a bag from my birthday party 2 years ago!!! Daddy says I am gonna be a pack rat just like my Mom!! I love her, so it's ok if I am like her!! Since Mom, quit working for Stampin' Up she said I can't just use anything I want anymore. I have to use my own scrap pieces of card stock and paper. 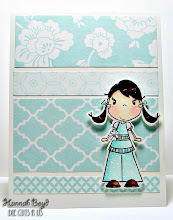 So that is what I did, I only used my things for this card (well her stamp set), which included my yucky glue stick that never works, but it held together long enough for the picture. Hope you all have a fun time with the challenge this week!!! Hannah so pleased you are now on our team. I love what you done with the tissue - it's like an explosion of birthday poppers. Darling Card Hannah!! I love the tissue paper. That is too funny about you becoming a pack rat like your Mom!! Welcome to the team!! Welcome to the team Hannah! How exciting for you! You are an inspiration for young scrappers/stampers. I really like how you used your tissue paper, what a fab idea and reusing things is always great! 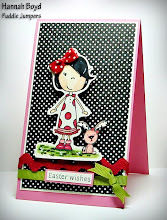 Gorgeous card Hannah :-) I love the tissue paper,, what a fabulous idea ! Congratulations, Hannah!!! I really love your card! Great job! Yep---you are definitley your Momma's child! haha You'll do great on this team!